In January 2008, it was announce that the Philadelphia Spectrum would be replaced by "Philly Live." We were all astounded to hear our beloved Spectrum would be no more. The year 2009 marked the last events for the venue. In the days since the last of the last, the facility was sold piece by piece. You could buy a piece of the basketball floor, a section of glass from the boards, and the seats. I looked on-line for a piece of the ice, but my hopes were melted as none could be found. So what is Philly Live? It was going to be a year round regional destination with attractions in a Main Street setting. Originally, this was going to be a 350,000 sq ft complex, but due to the economic conditions the project was scaled back to a phased approach. Phase I is scheduled to begin in April of 2011 with an estimated completion date of Mid-2012. 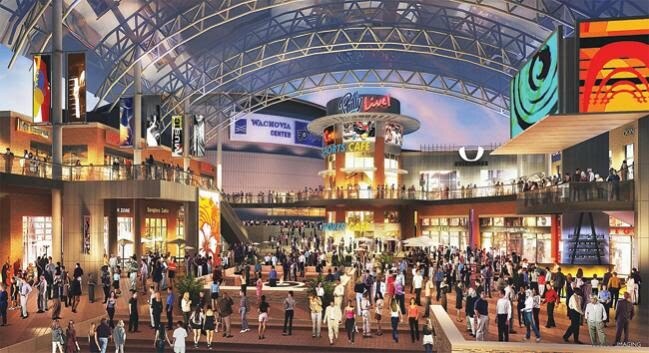 This first phase will include a 40,000 sq ft sports bar with Hockey and Basketball memorabilia. This project is a partnership between Comcast-Spectacor and The Cordish Company. More information can be viewed on the Cordish Companies web site. Below is another rendering from the Cordish Company on the project from 2010.